I’m writing a chapter right now on Stravinsky borrowings (quotations and the like) in Zappa’s music. The centerpiece of my analysis looks at the Petrushka fragments that make up Zappa’s guitar solo in the middle of “Status Back Baby.” Well, Stravinsky was a major influence on Zappa when he was young (see my post from October 23) and the lyrics of “Status Back Baby” are about life in high school, so I figured a little biographical sleuthing would be in order. 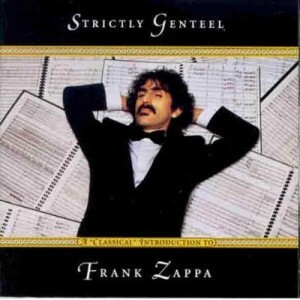 As I mentioned in my last post, Zappa was very concerned with producing some kind of synthesis of art and pop. He frequently alluded to how Varèse and Stravinsky were on equal footing with the R&B and blues records he listened to while he was growing up. It seems like he wanted to make something new by combining these two kinds of music. 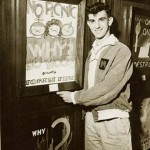 My dissertation–if you hadn’t already gathered–focuses on the convergence of popular and classical music streams that informs much of Frank Zappa’s music. This confluence means different things in different places (for both Zappa and his audience), but it seems to me to be a defining characteristic that runs through all of his work. My questions here are: Why would this be such an important aspect of his work? and, What influenced him in thinking this way? The second 33 1/3-RPM record I bought was by Stravinsky. 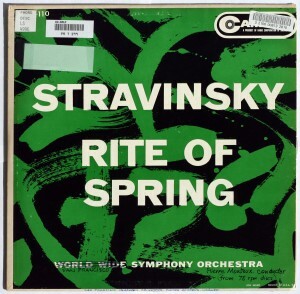 I found a budget-line recording (on Camden) of The Rite of Spring by something called ‘The World-Wide Symphony Orchestra.’ (Sounds pretty official, eh?) The cover was a green-and-black abstract whatchamacallit, and it had a magenta paper label with black lettering. I loved Stravinsky almost as much as Varèse. Much of my research relies primary sources. Lyrics, liner notes, bootlegs, interviews, and The Real Frank Zappa Book (FZ’s autobiography) make up the bulk of these sources. Along these lines, Avo Raup’s fantastic website Zappa Books–with its search-able database of interviews and zine articles–and Román García Albertos’ IINK (Information Is Not Knowledge)–a huge, cross-referenced database of lyrics and other album information–have been a tremendously helpful resources. But occasionally, I need to get right to the source. Such was the case with finding Zappa’s copy of Stavinsky’s The Rite of Spring.